Our legs were in agony and our poor stomachs were rumbling after our trek round the Museum. 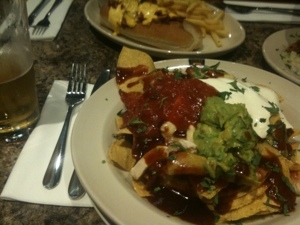 So obviously we needed to refuel – with Fully Loaded Nachos and a couple of pints of Budweiser…perfect! This entry was posted on Tuesday, October 23rd, 2012 at 4:15 pm	and is filed under Day by Day. You can follow any responses to this entry through the RSS 2.0 feed. You can leave a response, or trackback from your own site.